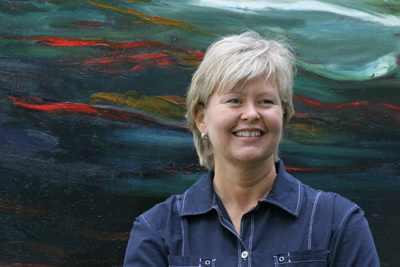 Nancy Pagh was born in Anacortes, Washington. Her poems are saturated in the tactile, the sensual, and the local— in them you will find the salal, rain, and butter clam. But, grounded in the body and the body’s relationship with the world, her poems seek wider significance and understanding. Nancy is the author of two award-winning poetry collections (No Sweeter Fat and After), a study of women boat travelers (At Home Afloat) and a guide to creative writing (Write Moves). She has taught in regional workshops such as the Port Townsend Writers’ Workshop, the Field’s End Writer’s Conference, and the Whidbey Island Writers Association conference. Nancy was the D. H. Lawrence Fellow at the Taos Summer Writers Conference and is a recipient of an Artist Trust/ Washington State Arts Commission Fellowship. She teaches at Western Washington University and lives in Bellingham. runs to meet its mother, sky. I say I was a glass jar of mussel shells. her horse, she said. As if I was just another person. my girlfriend said I was possessed by the Beatles. which I realized is life before childhood.